The Ground of the Mind contains many seeds. Which will all sprout when heavenly showers come. How can there be any more mutability? "At this point Ma-tsu was truly enlightened, his mind being transcended from the world of phenomena. He attended upon his master for full ten years. During this period he delved deeper and deeper into the inner treasury of mystical truth. It is said that of six outstanding disciples of Huai-jang, Ma-tsu alone got the mind of the master." "In the forty volumes of the Nirvana Sutra, how many words come from the Buddha and how many from demons?" Yang-shan said: "They are all demon words." Kuei-shan said: "From now on, no one will be able to pull the wool over your eyes." Tung-shan was a disciple of Yun-yen, who in turn was a disciple of Yo-shan. Yo-shan was first a disciple of Shih-t'ou and later of Ma-tsu, who were said to "divide the world between them," and who worked in cooperation. After his profession as a monk in his early twenties, Tung-shan made the traditional round of masters. He first visited Nan-ch'uan, then Kuei-shan. At the latter's recommendation, he went to Yun-yen. John Wu, in The Golden Age of Zen, tells how when Tung-shan was getting ready to journey on, he asked Yun-yen a final question: "After you have completed this life, what shall I say if anyone asks, 'Can you still recall your master's true face?'" Yun-yen remained silent for a long while and then replied, "Just this one is." Do not seek him anywhere else! Or he will run away from you! He is even now what I am. I am even now not what he is. Only by understanding this way can there be a true union with the Self-So. Wu says that the term he translated as Self-So is the Chinese for the Sanskrit Bhutatathata, which corresponds to the Eternal Tao, the Hindu Brahman, and the Old Testament I am That I Am. This is a remarkable distinction, as Wu comments, unlike that of the lesser "unitive" experience of Cosmic Consciousness. While HE is I, I am not HE. God is more myself than myself. This is the distinction between the Atman and the Brahman, between the True Man of Tao and the Eternal Tao. 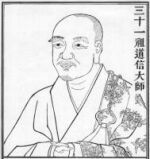 Lin-chi was a teacher of great originality who employed a technique of shouting to accomplish what his teacher, Huang-po, had accomplished by blows with his staff. Of course Lin-chi's students tried to copy his methods indiscriminately, as students everywhere are disposed to do  leading to a very noisy ashram. Regardless, Lin-chi made such a profound impact that a school of Zen developed from his teaching and methods, and that school is still active today under the Japanese pronunciation of his name, Rinzai. John Wu, in The Golden Age of Zen, gives us some of the inspiring words that went along with the shock-tactics. Lin-chi told an assembly, "If you wish to be free and untrammeled in the world of births and deaths... recognize right now the man who is listening to my sermon, who is above shape and form, not rooted or planted in any place, nor abiding in any abode. Yet he is very much alive and alert, responding readily to all situations with his unlimited resourcefulness, performing his function according to the circumstances without being pinned down to any. He eludes your embracing, evades your seeking. Hence he may be called the Great Secret." Lin-chi referred to this mysterious listener as the 'independent man of Tao,' the 'mother of all Buddhas.' "Right now, this man is clearly before our eyes with a brightness uniquely his own...."
Hui-k'o: My mind has not found peace. I beg you, Master, to pacify it for me. Bodhidharma: Bring forth your mind to me and I will pacify it for you. After a long silence, Hui-k'o told his master that he had searched for the mind but could not find it. Thereupon the Master said: Behold, I have already pacified the mind for you! Keizan (The Transmission of Light) tells us the story of Hui-k'o going to Shaolin monastery where Bodhidharma resided and standing outside in a snowstorm all night because he was refused admission. At dawn Bodhidharma supposedly said to him, "How can you hope for true realization, with little virtue, little wisdom, a shallow heart, and an arrogant mind?" Hui-k'o heard this as a merciful admonition, causing him to weep and building his determination, to demonstrate which he cut off his left arm with a sword. Hui-k'o was admitted and spent eight years with Bodhidharma. Keizan cites Mystic Devices in the Room, saying that one day Hui-k'o climbed Few Houses Peak with Bodhidharma and during that climb his teacher said something that triggered a realization of his true essence. When Bodhidharma was near death, Wu tells us, he called his four chief disciples and asked them to state their original insights. After hearing the first speaker, Bodhidharma told him that he was like Bodhidharma's skin; to the second, that she was like his flesh; to the third, that he was like his bone. To Hui K'o, who spoke last, Bodhidharma said that he was like his marrow, thus conferring the Patriarch's robe and bowl upon him. Wu also describes a conversation between Hui-k'o, after he had succeeded to the Patriarchate, and a layman of over forty years of age who came with an unusual request  begging the master to purify him of his sins. Hui-k'o, in the tradition of Bodhidharma, told him to bring forth his sins that he might expiate them for him. The layman, after a long silence, said: I have searched for the sins, but I have not been able to find them. Thereupon, Hui-k'o said: Behold, I have expiated them for you! The layman became a monk under the name Seng-ts'an, and would become the third Patriarch. Keizan writes that, after handing over Bodhidharma's robe to Seng-ts'an, Hui-k'o went to the city of Ye and spent the next thirty years living, unrecognized, with the common people. He sometimes spoke on the street and once gave a talk at a monastery gate, drawing a large crowd. A monk who was lecturing at the monastery at the same time was upset about losing attendees. He slandered Hui-k'o to a local official, who was fooled and prosecuted Hui-k'o, who submitted without complaint and was executed in 593. Thomas Cleary, in his notes section at the back of Instant Zen (teachings of Foyan, 1067  1120), says that Hui-k'o was laicized during a persecution of Buddhist orders in northern China. When asked why he continued to work at menial jobs, the Second Patriarch replied: "I am tuning my mind by myself; what business is it of yours?" He gave informal talks outside the gates of large Buddhist monasteries, drawing big crowds and angering the monks. He lived to be more than a hundred years old. The account of his enlightenment in No Barrier chapter 41 lays out a key method of meditation known as "turning the light around and looking back." 'Who has bound you?' Seng-ts'an replied. 'Nobody has bound me,' answered the monk. For that which is produced is not producible. Which sprouts when planted in causal ground. At the time of growth  yet nothing grows. 'Contemplating the mind,' said Niu-t'ou. 'But who is contemplating, and what is the mind contemplated?' Tao-hsin asked. "[Tao-hsin went on to say:] 'There are hundreds and thousands of dharmas and yogas, but all of them have their home in the heart.... All operations of cause and effect are like dreams and illusion. Actually there are no three realms to escape from. Nor is there any Bodhi or enlightenment to seek after. All beings, human and non-human, belong to one universal, undifferentiated Nature. Great Tao is perfectly empty and free of all barriers; it defies all thought and meditation.... All that you need is to let the mind function and rest in its perfect spontaneity. Do not set it upon contemplation or action, nor try to purify it. Without craving, without anger, without sorrow or care, let the mind move in untrammeled freedom, going where it pleases...."
Keizan, in The Transmission of Light, tells us that after succeeding to the Way, Tao-hsin concentrated his mind without sleeping and never lay down for the remaining 67 years of his life. He also relays an interesting story of how Tao-hsin rescued a city under siege in Qi province in 617. Tao-hsin: "What is your name?" Hung-jen: "I have an essence, but it is not a common name"
"Is is the essence of Buddhahood"
"None, because essence is empty"
Hung-jen was a boy of seven at the time, out begging with his mother. Tao-hsin recognized his capacity for truth and asked the mother to allow her son to become his disciple. And it will come to fruition on fertile ground. Nor can there be life without nature. According to John Wu (The Golden Age of Zen), Ma-tsu  "the Patriarch Ma"  was the most important figure in the history of Ch'an after Hui-neng. By then the title of patriarch was one of popular reverence and acclaim, since Hung-jen had told Hui-neng that there would be no more passing on of the Patriarchal Robe brought to China by Bodhidharma. This was also a rare instance of a Buddhist monk's being called by his family name, Ma. Ma-tsu was a disciple of Nan-yueh Huai-jang. Hui-neng is said to have told Huai-jang that the 27th Indian Patriarch, Prajnatara, had predicted that under your feet will come forth a spirited young horse who will trample the whole world. The Chinese word for horse is ma. Wu tells us that Ma-tsu had three outstanding disciples who enjoyed a special intimacy with him: Nan-ch'uan Pu-yuan, Hsi-t'ang Chih-ts'ang, and Pai-ch'ang Huai-hai. Although Nan-ch'uan had a special place in the master's heart, "Pai-ch'ang alone transcends the realm of things all by himself" in Ma-tsu's words, and it was Pai-ch'ang who became Ma-tsu's successor. Another outstanding disciple was Ta-chu Hui-hai, whose first interview with Ma-tsu is included in the Hui-hai page. Pai-ch'ang was a disciple of Ma-tsu, along with Hui-hai, and is considered to be Ma-tsu's dharma-successor. He is the one who instituted the Zen monastic system published five hundred years later in the Chinese Tripitaka, known as "The Holy Rule of Pai-ch'ang." It emphasized moral discipline and regulated the daily lives and responsibilities of monks as well as the duties of the abbot and various functionaries. This regimentation signifies to me that the golden age of Zen was on its way out by the time of Pai-ch'ang, since Zen is the antithesis of regimentation. As Alfred Pulyan, a twentieth-century American Zen master who worked through the mail wrote in a letter to a student, "Maybe I should say that there is an 'intellectual' sort of 'awakening' which produces a similar understanding & lasts through life [margin note: POSSIBLE EXPLANATION WHY SOME MEN APPEAR SO WISE], which lacks SIMULTANEOUS direct contact and ability to experiment with (!!) the Entity which is the One." This is Zen! That none shall coerce other members mentally or physically. That effort be more spontaneous than obligatory. That the mechanism for economic reciprocity and aid be automatic as far as the group is concerned, and voluntary as for relation one with the other. That none shall be a burden economically to the group or to other individuals. That alcohol shall not be brought into the communal grounds to be used for indulgence. That all members, while on communal grounds, shall abstain from any activity considered illegal  meaning activities that might bring about public condemnation of the group. This is not intended to limit opinion, for any member should say privately or publicly that which he wishes to say, regardless of his personal liability with the outside, and shall be still respected by the group. Ch'an Masters Home Page | Song Dynasty Revival | Self-Discovery Portal | Stumble It!